Want to grow your business, but not sure how to get it right? Equip yourself with new skills to determine your own growth trajectory. Learn the latest Growth Planning development techniques from the experts at GROW|STRATEGY. 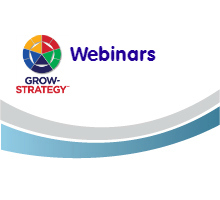 Our 1 hour webinar series begins with Foundation sessions, followed by 9-steps Blueprint in the GROW|STRATEGY methodology and ending in topics on advanced issues to Sustain your success. Click on any of the webinars below to learn more.